To Cite: Vaziri F, Taheri M, Tavana Z. 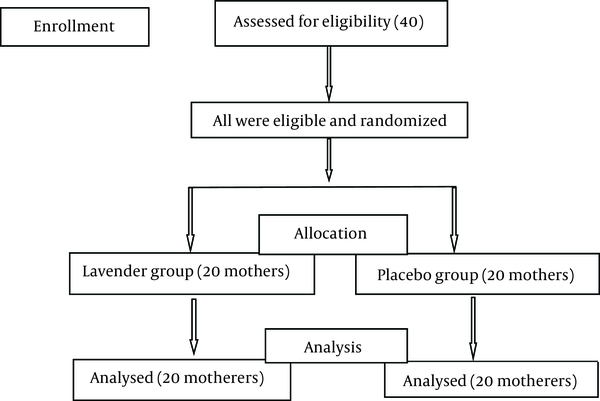 Lavender Inhalation on Intramuscular Injection Pain of Magnesium Sulfate in Pre-Eclamptic Mothers: A Randomized Controlled Trial, Women Health Bull. 2018 ; 5(2):e62449. doi: 10.5812/whb.62449. Background: Repeated maintenance intramuscular injections of magnesium sulfate can be painful experiences. This study was conducted to investigate the effect of lavender oil on intramuscular injection pain of magnesium sulfate. Methods: This randomized placebo controlled clinical trial was performed on 40 females undergoing postpartum care. The females were assigned to the lavender oil and placebo groups with 20 samples in each group. They received lavender oil inhalation or placebo 10 to 15 minutes before and after injections. The pain during and after the intramuscular injection was assessed using the visual analog scale and verbal reports. In addition, the pain during an intramuscular injection without any intervention was measured and considered as baseline pain. Results: The intensity of pain at baseline had a mean value of 68 ± 23.78, with a median value of 72, and mode of 100. Also, 55% of the females described their pain verbally as severe and very severe. Upon interventions, the 2 groups had no statistically significant differences in relation to the intensity of pain during and after the intramuscular injection (t-test and Mann-Whitney U test, respectively). According to the paired-wise analysis, the intensity of pain during the intramuscular injection upon the intervention was lower than baseline in the lavender essential oil group (P = 0.01). Nevertheless, Fisher’s exact test showed that the female’s satisfaction was higher in the lavender essential oil group compared to the placebo group (P = 0.01). Conclusions: This study supports the use of aromatherapy with the aim to improve patient well-being in painful medical procedures. Injections are typical routes for administration of a variety of drugs in humans. The most frequent adverse effects related to injections are discomfort and pain. Such pain can be due to the insertion of needles in the skin, while, the mechanical and chemical effects of drugs can produce prominent pain and suffering during and after injections (1). In one study, 40% of patients described receiving intramuscular (IM) injections as very painful (2). Injection phobia following a painful injection causes many difficulties and embarrassment for the next necessary injections (3). Recently, several studies have focused on pain management during injection procedures, especially during childhood vaccinations. Researchers have examined the effectiveness of different pain-relieving methods, such as applying pressure (4), acupressure (5), cooling the skin at the injection site, distraction (6), positioning, speed of injection and needle characteristics (7-9) on the intensity of pain following injections. Aromatherapy is frequently used in combination with massage therapy. Aromatherapy is described as the use of aromatic essences for improving mental health or relieving physical symptoms. Studies on non-human samples reported that inhaled essential oils could enter the bloodstream and induce pharmacologic effects through stimulating the production of endorphins and norepinephrine (10, 11). Lavender oil is a well-known aromatic essence with mood-enhancing and sedative properties (12). In numerous studies, the effect of lavender oil aromatherapy for pain alleviation has been studied with different results (13, 14). Magnesium sulfate is the drug of choice for preventing and treating convulsion in hypertensive disorders of pregnancy. Repeated IM injections of magnesium sulfate following its loading dose are painful and need consideration by healthcare professionals in the field of obstetrics (15, 16). Thus, this study was conducted to investigate the effect of lavender oil inhalation aromatherapy on IM pain of magnesium sulfate in mothers with pre-eclampsia in the postpartum period. This randomized placebo controlled clinical trial was conducted from August 2015 to early December 2015. Samples consisted of mothers undergoing postpartum care at Hafez teaching hospital affiliated to Shiraz University of Medical Sciences, Shiraz, Iran. The following inclusion criteria were used: age of 18 or older with an alive infant, having a good sense of smell, no history of mental illnesses, no addiction to narcotic drugs or alcohol, undergoing IM injection of magnesium sulfate according to the physician’s order due to preeclampsia. The observation of any lesion on the injection site and allergic reactions to the study substances led to the exclusion of the females. Initially, mothers, who were under postpartum care, were invited to participate in this study based on the above-mentioned inclusion criteria. An informed consent form was signed by those, who willingly agreed to take part in this study. Preparation of lavender oil: Lavendula officinalis species was bought from the pharmacy of traditional medicine affiliated to Shiraz University of Medical Sciences. The lavender essence was created using a steam distillation apparatus in the pharmacology lab of the school of medicine affiliated to the university (17). The concentration of lavender essential oil was reduced to 10% by using sweet almond oil. Therefore, 5 cc of lavender essence oil was dissolved in 45 cc of almond oil. This dose was suggested by Bagheri-Nesami et al. in their study on an Iranian adult population (18). Intervention in the lavender group: the females in the lavender group received inhalation of lavender essential oil for 10 to 15 minutes prior to the IM injection of magnesium sulfate. The research assistant instilled 5 drops of lavender essential oil on 3 layers of a tissue and asked the women to hold it in front of their nose and breathe normally. This procedure was continued during the IM injection and 10 to 15 minutes after the injection. Intervention in the placebo group: the females in the placebo group received sweet almond oil aromatherapy that was free of lavender essence using the same procedure. The almond oil was provided by the Baridge-essence pharmaceutical company, Kashan, Iran. IM injection method: five grams of magnesium sulfate from 50% concentration solution, 10 cc volume, was injected in the buttocks in the lateral position (19) using a 10 cc disposable syringe with a 23-gage needle. All the IM injections for both groups were performed by a single skilled midwife as the research assistant. The intensity of IM injection pain was assessed 3 times for all females in the groups. At first, the research assistant recorded the intensity of pain immediately after the IM injection without any intervention and under routine care, which was termed ‘during injection pain’ at baseline. For the next IM injection, the intervention by lavender oil or placebo was performed and then the intensity of pain was measured immediately after the injection, which was termed ‘during injection pain upon the intervention’. Lastly, 10 to 15 minutes after the IM injection, the intensity of pain was recorded for a third time, which was named post injection pain. Data about the intensity of pain was recorded using the visual analog scale (VAS) consisting of a 100-mm ruler numerated from 0 to 100 representing no pain to the worst possible pain, respectively. In addition, the females were asked to describe verbally the intensity of their pain as mild, moderate, severe, and very severe at 3 different time points in this study (verbal report of pain intensity). At the end of the intervention, the research assistant measured the amount of the female’s satisfaction with this intervention by using the following open-ended question: How satisfied were you with this method? The participants’ responses were categorized as ‘not satisfied at all’, ‘somewhat satisfied’, ‘satisfied’, and ‘very much satisfied’. Sample size and randomization: no previous study, designed to determine the mean pain intensity of magnesium sulfate injection, was used for estimating the sample size. Therefore, a pilot study was performed and the number of samples was set as 20 females in each lavender oil and almond groups. This sample size could produce more than 80% power (20). In this study, the participants were allocated to 2 study groups by the block randomization method. Based on 10 blocks, the block size was 4 (ABAB, AABB,....), and randomization was completed. The data was analyzed using descriptive and inferential statistics via the SPSS software, v.18. P values of < 0.05 were considered statistically significant. The independent t-test was used for comparing the means between the groups. A paired samples t-test was used to compare 2 related means. The Mann-Whitney U test, as a nonparametric test, was used when the normality assumption did not hold for the data in groups. Also, the Chi-square test or Fisher’s exact test were used to test categorical variables. Also, the repeated measures test was used for assessing the longitudinal study. This was a single-blind study. All participants were blind to the aromatherapy essences. Since the usual surgical mask used in the research zone could not provide appropriate blindness towards smelling and advanced masks were unavailable, the research assistant was not blind to the smell of the oils. This study was approved by the ethics committee affiliated with Shiraz University of Medical Sciences with the following ethics code: IR. SUMS.REC.1394.7. Also, the protocol of this study was registered at the Iranian registry of clinical trial’s website (registration code: IRCT2015031710327N12). In this study, 40 females, including 20 individuals in each group were selected. None of them withdrew from the study process and their data was included in this study (Figure 1). The mean age of the females was 30.42 ± 6.06 years. The minimum and maximum age were 21 and 40, respectively. Most of the females (39 mothers; 97.5%) were housewives and 20 mothers (50%) had high school diplomas or academic education. Of all females, 18 mothers (45%) were primiparous and 22 (55%) were multiparous with parity of 2 and 3. They were all married and the method of their childbirth was as follows: caesarean section in 32 mothers (80%) and vaginal childbirth in 8 mothers (20%). The lavender and control groups had no statistically significant differences with respect to age (P = 0.77), education (P = 0.90), job (P = 1), parity (P = 0.65), and the method of childbirth (P = 1). The intervention was performed between 8 am and 20 pm with the following details: 18 injections (45%) between 8 and 12 am; 15 injections (37.5%) between 12.1 and 16 pm and 7 injections (17.5%) between 16.1 and 20 pm. 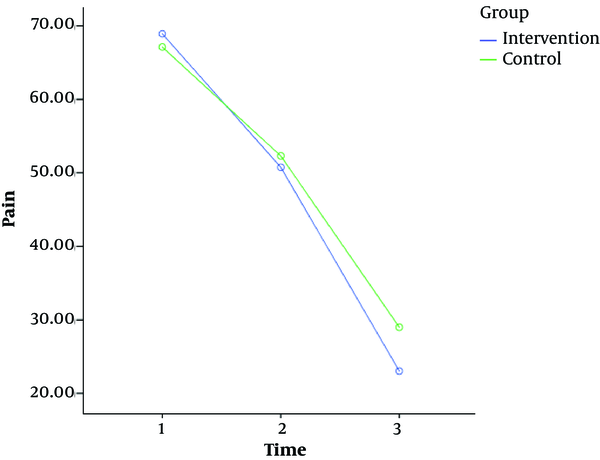 The 2 groups were homogeneous in terms of the injection time (P = 0.69). Injection order was recorded; 17 cases (42%) were at the second or third injection while 23 cases (54%) were at 4th, 5th and 6th injection. Fisher’s exact test showed that the 2 groups were not significantly different (P = 0.869). ‘During injection pain at baseline’: in all participants, the mean score of pain was 68 ± 23.78 with a minimum and maximum value of 10 and 100, respectively. This variable had a median value of 72 and a mode value of 100. With regards to the verbal report, 3 mothers (7.5%) reported mild pain, 15 mothers (37.55%) reported moderate pain, 12 mothers (30%) reported severe pain, and 10 (25%) reported very severe pain. The verbal report of pain was not associated with the level of education (P = 0.16) and parity (P = 0.48). No statistically significant correlation was observed between pain scores and maternal age (r = -0.28, P = 0.07). In addition, pain scores in the primiparous and multiparous females had no statistically significant differences (64.77 ± 25.82 versus 70.63 ± 22.24, respectively, P = 0.42). No statistically significant differences were reported in pain scores with respect to the method of childbirth (69.75 ± 19.43 versus 67.56 ± 25.01 respectively, P = 0.78). The 2 groups had no statistically significant differences in relation to the baseline intensity of pain or verbal intensity of pain (Tables 1 and 2). ‘During injection pain upon the intervention’: the mean of pain score was 51.52 ± 26.62 with a minimum and maximum value of 7 and 100, respectively. It had a median and mode value of 50. With regards to the verbal report of pain, 11 mothers (27.5%) reported mild pain, 14 mothers (35%) reported moderate pain, 12 mothers (30%) reported severe pain, and 3 (7.5%) reported very severe pain. None of the mothers in the lavender group reported the severity of their pain as very severe. The 2 groups had no statistically significant differences in relation to pain score or the verbal report of the severity of pain (Tables 1 and 2). Post injection pain: in all participants the mean score of pain was 26.02 ± 18.07 with a minimum and maximum value of 3 and 97, respectively. It had a median value of 21.50 and a mode value of 20. Regarding the verbal report of severity of pain, 30 mothers (75%) reported mild pain, 9 mothers (22.5%) reported moderate pain and 1 mother (2.5%) reported very severe pain. The 2 groups had no statistically significant differences in terms of post injection pain score and verbal report of the severity of pain (Tables 1 and 2). However, 16 (80%) of the females in the lavender group were satisfied or very satisfied with the intervention (Table 2). The participants were limited to those, who gave birth using the caesarian section method (n = 32) and the comparison of the means was performed once more. The 2 groups had no statistically significant differences at baseline (P = 0.91), upon the intervention (P = 0.63) and post injection (P = 0.10). Paired t-test: overall, during injection pain scores at baseline and upon the intervention had statistically significant differences (68 ± 23.78 versus 51.52 ± 26.62, respectively, P = 0.002). During injection pain at baseline and upon intervention were compared in both groups. A statistically significant reduction in pain was observed in the lavender group (baseline pain: 68.90 ± 20.19 versus upon the intervention: 50.75 ± 22.37, P = 0.01). However, in the control group, pain scores had no statistically differences (baseline pain: 67.10 ± 27.42 versus upon the intervention: 52.30 ± 30.37, P = 0.06). During injection pain upon the intervention and post injection pain was compared, which had statistically significant differences in both groups (P = 0.001). Longitudinal analysis: according to the repeated measures analysis, the intensity of pain was decreased across the data collection points in both groups (Table 1). Also, pain was reduced in all participants (F = 49.03, P < 0.0001). However, no such statistically significant differences were observed between the groups (F = 0.1, P = 0.7) (Figure 2). The present study was conducted to examine the effect of 10% lavender essential oil aromatherapy on IM injection pain of magnesium sulfate. The IM injection of magnesium sulfate is considered painful. Therefore, it is recommended to use topical numbing drugs on the injection site (21). In the current study, high mean pain score at the baseline (68 ± 23.78) and 55% verbal report of severe and very severe pain perception revealed that the IM injection of magnesium sulfate could be considered as one of the most painful injections. No previous research was found regarding the severity of pain due to IM injection of magnesium sulfate. However, the perception of pain from IM injection for hepatitis B vaccine was described by Nahm et al. They reported that the mean score of pain was 20.8 ± 17.1 mm with a range of 0 to 67 in males and 34.4 ± 19.7 mm with a range of 2 to 76 in females (22). In another study on female participants, the mean pain score in the penicillin injection group without any intervention was 4.8 cm (23). Regarding the comparison of the findings of these studies with the current baseline data, IM injection pain of magnesium sulfate was noticeably higher than the IM injection of hepatitis B vaccine and penicillin group drugs. However, the baseline results were roughly similar with the IM injection pain of penicillin benzatin (1/200/000 U), indicating 7.39 ± 1.55 cm in a group including male and female participants without receiving any intervention (24). In the present study, lavender essential oil aromatherapy decreased IM injection pain of magnesium sulfate, yet the statistical tests showed no significant differences between the groups. The probable reason for such findings was the small sample size in this study. However, there were some indications of the benefits of lavender essential oil aromatherapy on the reduction of pain. For instance, according to within group analyses, i.e. pain at baseline versus upon the intervention pain, a statistically significant reduction was found in the intensity of pain in the lavender group. Moreover, the participants reported greater satisfaction in the lavender group compared with the control group. On the other hand, pain upon intervention was significantly lower than pain at baseline among all females. Possible explanations for such findings could be distraction induced by smelling and placebo effects. Distraction works through gate control theory of pain (25). Induced anticipation or expectancy through a placebo intervention can commonly lead to the placebo response (26). Numerous studies reported positive results regarding the effect of lavender essential oil aromatherapy on pain reduction. Accordingly, pain reduction was reported after an operation, needle-insertion, dressing change, dysmenorrhea, and perineal pain after episiotomy (18, 27-29). Emotional components play an important role in pain sensation and response to pain. Some studies have been conducted on the effects of fragrant aromas on the human brain and emotions. It has been speculated that chemical components in essential oil could bind to the receptors of the olfactory bulb, and impact the limbic system as the brain’s emotional center. Therefore, fragrant aromas can influence mood and affect (30, 31). A rapid and short-term improvement in emotional and spiritual wellbeing is a possible mechanism for pain reduction during painful medical procedures, such as the IM injection of magnesium sulfate. The authors conducted a search of electronic databases, including Pubmed, Scopus, and Google Scholar using the keywords of ‘IM injection pain’, ‘magnesium sulfate’, ‘aromatherapy’, and ‘lavender oil’ until 2015. The present study was the first clinical trial that examined the effect of aromatherapy on IM injection pain of magnesium sulfate. The small sample size, the study design being single blinded, and not assessing deep clinical effects of lavender essential oil aromatherapy on mothers, such as blood pressure fluctuations, duration of staying in bed, and pain during walking after injection were the limitations of this study. Since the outcome variables were measured using the data collected via the self-report by participants using the VAS or verbal reports rather than observations by the research assistant, the impact of the single blind limitation was diminished. Therefore, further studies with a large sample size, the use of a device to block the examiner’s sense of smelling, and enhanced clinical assessments are suggested. According to the findings of this study, lavender essential oil aromatherapy had the capacity to reduce IM injection pain of magnesium sulfate. Therefore, this intervention can be used by midwives for improving patients’ well-being during painful medical procedures. The study was supported financially by the research vice-chancellor of Shiraz University of Medical Sciences. The authors would like to thank them and also the University’s research consultation center (RCC) and center for development of clinical research of the Nemazee hospital for their assistance in editing this article and data analyses. Also, the authors would like to thank the participants for their sincere collaboration in this research project. Conflict of Interest: The authors declare no financial or personal relationships with other people or organizations that may lead to conflict of interests. Registration Code in the Iranian Registry of Clinical Trials’ Website: IRCT2015031710327N12. 1. Taddio A, Ilersich AL, Ipp M, Kikuta A, Shah V, H. ELPinKIDS Team . Physical interventions and injection techniques for reducing injection pain during routine childhood immunizations: systematic review of randomized controlled trials and quasi-randomized controlled trials. Clin Ther. 2009;31 Suppl 2:S48-76. doi: 10.1016/j.clinthera.2009.07.024. [PubMed: 19781436]. 2. Cupitt JM, Kasipandian V. Pain and intramuscular injections. Anaesthesia. 2004;59(1):93. doi: 10.1111/j.1365-2044.2004.03589.x. [PubMed: 14687110]. 3. Mohr DC, Cox D, Merluzzi N. Self-injection anxiety training: a treatment for patients unable to self-inject injectable medications. Mult Scler. 2005;11(2):182-5. doi: 10.1191/1352458505ms1146oa. [PubMed: 15794392]. 4. Barnhill BJ, Holbert MD, Jackson NM, Erickson RS. Using pressure to decrease the pain of intramuscular injections. J Pain Symptom Manage. 1996;12(1):52-8. doi: 10.1016/0885-3924(96)00049-8. [PubMed: 8718917]. 5. Suhrabi Z, Taghinejad H. Effect of acupressure (UB32) on pain intensity in intramuscular injections. Iran J Nurs Midwifery Res. 2014;19(1):24-7. [PubMed: 24554956]. 6. Hasanpour M, Tootoonchi M, Aein F, Yadegarfar G. The effects of two non-pharmacologic pain management methods for intramuscular injection pain in children. Acute Pain. 2006;8(1):7-12. doi: 10.1016/j.acpain.2005.11.001. 7. Ipp M, Taddio A, Sam J, Gladbach M, Parkin PC. Vaccine-related pain: randomised controlled trial of two injection techniques. Arch Dis Child. 2007;92(12):1105-8. doi: 10.1136/adc.2007.118695. [PubMed: 17686797]. 8. Torrance JT. Children's reactions to intramuscular injections : a comparative study of needle and jet injections, final report. Cleveland, Ohio: Frances Payne Bolton School of Nursing, Case Western Reserve University; 1968. 9. Ozdemir L, Piotanarciota E, Akay BN, Akyol A. Effect of methylprednisolone injection speed on the perception of intramuscular injection pain. Pain Manag Nurs. 2013;14(1):3-10. doi: 10.1016/j.pmn.2010.03.002. [PubMed: 23452521]. 10. Wilkinson SM, Love SB, Westcombe AM, Gambles MA, Burgess CC, Cargill A, et al. Effectiveness of aromatherapy massage in the management of anxiety and depression in patients with cancer: a multicenter randomized controlled trial. J Clin Oncol. 2007;25(5):532-9. doi: 10.1200/JCO.2006.08.9987. [PubMed: 17290062]. 11. Perry N, Perry E. Aromatherapy in the management of psychiatric disorders: clinical and neuropharmacological perspectives. CNS Drugs. 2006;20(4):257-80. [PubMed: 16599645]. 12. Steflitsch W, Steflitsch M. Clinical aromatherapy. J Mens Health. 2008;5(1):74-85. doi: 10.1016/j.jomh.2007.11.001. 13. Olapour A, Behaeen K, Akhondzadeh R, Soltani F, Al Sadat Razavi F, Bekhradi R. The Effect of Inhalation of Aromatherapy Blend containing Lavender Essential Oil on Cesarean Postoperative Pain. Anesth Pain Med. 2013;3(1):203-7. doi: 10.5812/aapm.9570. [PubMed: 24223363]. 14. Kim JT, Wajda M, Cuff G, Serota D, Schlame M, Axelrod DM, et al. Evaluation of aromatherapy in treating postoperative pain: pilot study. Pain Pract. 2006;6(4):273-7. doi: 10.1111/j.1533-2500.2006.00095.x. [PubMed: 17129308]. 15. Cunningham FGKJ, Bloom SL, Hauth JC, Gilstrap K, Wenstrom KD. Williams Obstetrics. 22nd ed. Philadelphia: Mc Graw Hill; 2005. p. 705-6. 16. Okusanya BO, Oladapo OT, Long Q, Lumbiganon P, Carroli G, Qureshi Z, et al. Clinical pharmacokinetic properties of magnesium sulphate in women with pre-eclampsia and eclampsia. BJOG. 2016;123(3):356-66. doi: 10.1111/1471-0528.13753. [PubMed: 26599617]. 17. Lesage-Meessen L, Bou M, Sigoillot JC, Faulds CB, Lomascolo A. Essential oils and distilled straws of lavender and lavandin: a review of current use and potential application in white biotechnology. Appl Microbiol Biotechnol. 2015;99(8):3375-85. doi: 10.1007/s00253-015-6511-7. [PubMed: 25761625]. 18. Bagheri-Nesami M, Espahbodi F, Nikkhah A, Shorofi SA, Charati JY. The effects of lavender aromatherapy on pain following needle insertion into a fistula in hemodialysis patients. Complement Ther Clin Pract. 2014;20(1):1-4. doi: 10.1016/j.ctcp.2013.11.005. [PubMed: 24439636]. 19. Lu JF, Nightingale CH. Magnesium sulfate in eclampsia and pre-eclampsia: pharmacokinetic principles. Clin Pharmacokinet. 2000;38(4):305-14. doi: 10.2165/00003088-200038040-00002. [PubMed: 10803454]. 20. Whitehead AL, Julious SA, Cooper CL, Campbell MJ. Estimating the sample size for a pilot randomised trial to minimise the overall trial sample size for the external pilot and main trial for a continuous outcome variable. Stat Methods Med Res. 2016;25(3):1057-73. doi: 10.1177/0962280215588241. [PubMed: 26092476]. 21. van der Plas AA, Schilder JC, Marinus J, van Hilten JJ. An explanatory study evaluating the muscle relaxant effects of intramuscular magnesium sulphate for dystonia in complex regional pain syndrome. J Pain. 2013;14(11):1341-8. doi: 10.1016/j.jpain.2013.05.013. [PubMed: 23954520]. 22. Nahm FS, Lee PB, Park SY, Kim YC, Lee SC, Shin HY, et al. Pain from intramuscular vaccine injection in adults. Rev Med Chil. 2012;140(2):192-7. doi: 10.4067/S0034-98872012000200007. [PubMed: 22739948]. 23. Masoudi Alavi N. Effectiveness of acupressure to reduce pain in intramuscular injections. Acute Pain. 2007;9(4):201-5. doi: 10.1016/j.acpain.2007.09.002. 24. Farhadi A, Esmailzadeh M. Effect of local cold on intensity of pain due to penicillin benzathin intramuscular injection. Int J Med Med Sci. 2011;3(11):343-6. 25. Moayedi M, Davis KD. Theories of pain: from specificity to gate control. J Neurophysiol. 2013;109(1):5-12. doi: 10.1152/jn.00457.2012. [PubMed: 23034364]. 26. Oken BS. Placebo effects: clinical aspects and neurobiology. Brain. 2008;131(Pt 11):2812-23. doi: 10.1093/brain/awn116. [PubMed: 18567924]. 27. Hadi N, Hanid AA. Lavender essence for post-cesarean pain. Pak J Biol Sci. 2011;14(11):664-7. doi: 10.3923/pjbs.2011.664.667. [PubMed: 22235509]. 28. Sheikhan F, Jahdi F, Khoei EM, Shamsalizadeh N, Sheikhan M, Haghani H. Episiotomy pain relief: Use of Lavender oil essence in primiparous Iranian women. Complement Ther Clin Pract. 2012;18(1):66-70. doi: 10.1016/j.ctcp.2011.02.003. [PubMed: 22196577]. 29. Raisi Dehkordi Z, Hosseini Baharanchi FS, Bekhradi R. Effect of lavender inhalation on the symptoms of primary dysmenorrhea and the amount of menstrual bleeding: A randomized clinical trial. Complement Ther Med. 2014;22(2):212-9. doi: 10.1016/j.ctim.2013.12.011. [PubMed: 24731891]. 30. Johnson AJ. Cognitive facilitation following intentional odor exposure. Sensors (Basel). 2011;11(5):5469-88. doi: 10.3390/s110505469. [PubMed: 22163909]. 31. Burnett KM, Solterbeck LA, Strapp CM. Scent and mood state following an anxiety-provoking task. Psychol Rep. 2004;95(2):707-22. doi: 10.2466/pr0.95.2.707-722. [PubMed: 15587240].